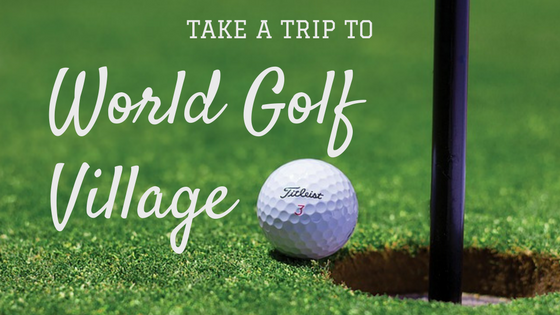 Every now and then Florida experiences a rainy day and I am often asked, “What would you do on a rainy day?” Personally, I like going to World Golf Village. Side note: I’m going to tell you a little Florida secret – we rarely have rainy days, but plenty of sunny showers, so they don’t normally last very long. So what if you don’t like golfing? That’s ok, it’s still fun! I have a good friend that is not into golfing at all, she’d much rather go fishing in the Matanzas, but likes going to the World Golf Village for a few fun activities for those that would rather fish than golf. Of course if you love golfing, this is a must do while visiting us at Beacher’s Lodge. The IMAX Theater at the World Golf Hall of Fame is a must for a rainy day!!! Not only is the screen massive but it features 3D projection!!!! 3D experiences are always cool and the kids love it!!! The seating and atmosphere are very comfortable and inviting. I highly recommend you watch a movie here whether you have kiddos or not. World Golf Hall of Fame is more interesting that you might think. Remember that friend that I told you about that is not an avid golfer, well she loves the section of the hall fame that displays golfers good luck charms! You’d be amazed at what is on display. For instance my favorite part is the Trophy Tower where the display the “Perfect Swing,” an art installation that displays 162 hand-crafted crystals!!! It is truly breathtaking and a sight to be seen! In addition to being a fan of the “Perfect Swing.” I am a fan of Bob Hope. The tribute to him at World Golf Hall of Fame is something to take note. While enjoying your day at World Golf Village you have to eat at Caddyshack!!!! Owned by the Murray Bros, as in Bill Murray. The Murray Brothers named the restaurant after Bill Murray’s movie, Caddyshack, and decided that St. Augustine’s World Golf Village was the appropriate place for their first restaurant of many. Bring an appetite as the portions are quite large! I have told you everything to do there if you are not a huge golf fan. But, if you are a fan of the golfing game, than the possibilities are endless. You could spend hours in the museum or on the golf course. Want to work on your golf game? Then the PGA Tour Academy is just what you are looking for. They have state of the art training programs with some good instructors. They have different levels of packages, from beginners to private bookings. You name it, they thought of a package for it. In a nutshell World Golf Village is a golfer’s dream come true.